Fabulous pictures and music make this FTD release a must buy! The quality, creativity and depth of Elvis' work in the fifties would never be surpassed. Elvis fans are always hoping for something new about that special period and here FTD present us with their second 'audiovisual documentary' combining a 170 page book of rare & fascinating photos with a CD of unreleased material from 1956-1958. The Visuals. In the same way that Elvis stares out at us from the cover, the book lets us look into his life enabling us to explore deeply his public & personal life via the 18 chapters which all focus on specific periods. The authors Sherif Hanna & Ernst Jorgensen are the best in the business and with nearly 300 photos there is plenty to explore. There are so many rare & previously unpublished candids & behind-the-scenes photos that it is hard to pick out any particular favourites. It is all so damn good! I particularly like Elvis' off-stage bolero jacket from Vegas 1956 and it is a delight that there are so many non-posed photos, capturing a relaxed and spontaneous Elvis, before the publicity shoots took hold. The section on Miami August 1956 captures the true intensity of an early Elvis concert, in fact the crowd was so excited that they tore Elvis' trousers off! There are some amusing shots of Elvis sitting in only his boxer shorts after the gig! Maybe the highlight of the book is the fact that in the fifties Elvis did let photographers follow him where-ever he went and from these pictures we can get a little more understanding about what it must have been like for him to live through these turbulent 30 months. From my point of view another highlight is the studio shots of Elvis' recording sessions. By looking at the sound-stage for the recording of the Love Me Tender soundtrack you can appreciate even more why the songs sound like they do. Of course, Scotty & Bill were cruelly left out of that session but there are plenty of early Radio Recorders shots, which again bring those soundtracks (Loving You, Jailhouse Rock etc) to life. There is some fascinating memorabilia too noting that 'Danny' would be used in the film King Creole & explaining the 'Baby, I Don't Care' overdub session. Perhaps the most fascinating aspect is the glimpses you can see of a still shy and unsure Elvis before the fame & fortune truly got to him. The pictures of Elvis' return to Tupelo in September 1956 are particularly enlightening. Already a huge star, Elvis still looks so young & innocent. The enormity of the stadium with almost no amplification is fascinating to see. Did anyone ever hear Elvis singing at his fifties concerts? ! While the majority of the photos are Black & White there are plenty of absolutely gorgeous colour pages. The images of Elvis in his gold lame suit (live March 1957) are sensational, as are the Love Me Tender publicity shots (gorgeous red-velvet shirt & with his hair still brown) and the Chicago Press conference photos in his striped tan jacket are all essentials for any Elvis collection. If I have any complaint, it is that I would have loved to have more information, (Exact dates, who is with Elvis, etc) to accompany every photo. But there is no doubt that the lack of text on the page does make the layout, a great job by Nic Oxby, look particularly appealing. The Audio. 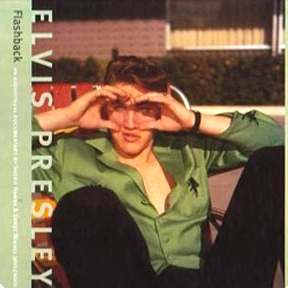 In the same way that the photos let us explore Elvis' personal life the CD, of 25 unreleased outtakes from the same period, is what everyone has been asking for. Another superb-sounding collection of songs from Elvis in the fifties and, while it has to be obvious that there can be hardly any really new material left from the fifties, this is a great selection. Every track is worth exploring and Ernst has even discovered the last half of take 4 of Heartbreak Hotel, so we are even treated to another version of the classic Elvis song to start the CD. There are so many great new versions of classic Elvis tracks and many are earlier takes than we already have. While many of these have been available on previous bootlegs the audio improvement is so good that it is like hearing them afresh. It's great to get a completely new take of 'I Was The One'. The information says Take 7 (same as the single) unedited, however Elvis' phrasing is slightly different from the actual single Master. Hearing Elvis rock through new versions of 'Lawdy, Miss Clawdy' and 'Shake, Rattle & Roll' is also a delight. There is that special feeling of eavesdropping on Elvis and the band as they create & develop these masterpieces and if you don't have these elsewhere you will be stunned. As Elvis says, "Hang up that tambourine and go!" Similarly the four takes of 'Rip It Up' are essential. D.J. Fontana plays a much more laid-back beat and there is a tremendous ambience you can hear from the studio. In the earlier takes Scotty Moore's guitar solo is nice and rough too! Early Take 2 of 'A Big Hunk O' Love' has Elvis really enthusing over the song, joining in while Scotty plays the solo. In a similar way we have 5 of the earliest attempted takes of 'I Got Stung' which shows Elvis in a fantastic & creative mood. These are a long way from the Master (Tk 24) and are great listening. The rock 'n' roll is nicely balanced by the ballads and the earliest released take of 'I Want You, I Need You, I Love You' finds Elvis sounding very unsure and reticent. The song also has a completely different arrangement and tempo to the middle-eight. Fascinating. 'I'm Counting On You' is also a delight since the original version seemed to come from a tape that was running a little slow and here that at last has been corrected. The audio quality is so clear and the backing vocals have a simpler arrangement. The last ten tracks are Binaural recordings (Elvis' vocal on a separate track) and we are also treated to the very first flawed & primitive take of 'That's When Your Heartaches Begin'. The backing vocals are all over the place! Similarly I can never get enough versions of the gorgeous 'Is It So Strange' and the remastering lets you hear every delightful studio moment. And even though we have multiple takes of 'Loving You' there is a great sound to Bill Blacks' bass here that again makes these worthy additions. 'Treat Me Nice' however has to be the highlight of the whole CD and these three takes alone are worth the price of the CD! Elvis and the band try and work out the arrangement which is so totally different from the final single, and also from the movie versions on 'Close Up'. At the start Elvis says to the studio, "Hold it a minute Thorny and let's get this straight"! Dudley Brooks plays a totally different rhythm on the piano and Elvis nonchalantly slaps his guitar for a backbeat. Elvis vocal work is deliciously cool and at the end he breaks up with enjoyment. Elvis says, "That's a Hit"! Absolutely sensational. Verdict - While a little expensive for some, in a similar way to their earlier FTD outing "That's The Way It Was", the CD and book are worth every hard-earned cent. Elvis fans and collectors will get hours of fun and enjoyment while exploring both the pictures and the fabulous music. If you like Elvis in the fifties this book & CD are an absolute must. MORE EIN relevant reviews and information.